This is actually the second time I’ve featured ‘If I Fell’ on this blog. The first was back in April, when I chose Evan Rachel Wood’s version from the film Across the Universe as my 277th Song of the Day. I believe this song joins Ben Folds Five’s ‘Emaline’ (a live version and a cover) as the only songs to appear in two different Song of the Day posts. I’ll go ahead and link up a third version of the song because I know Amy will if I don’t. 🙂 Here’s American Idol contestant Jason Castro’s version with the added benefit of clips from one of television’s very best shows, Friday Night Lights. And now, with all that housekeeping out of the way, make room for the main attraction… John and Paul’s harmony vocals on the definitive version of one of the best songs ever written. And that she will cry when she learns we are two. 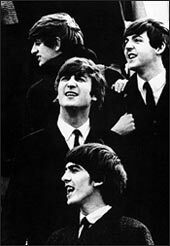 This entry was posted in beatles weekends and tagged A Hard Day's Night, If I Fell, The Beatles. Just in case anyone wants to see/hear him sing it live 🙂 – and also see why Maddie and I want to kill the “fans” in the front that clap for everything, and why we’ll miss Paula “I feel your heart” Abdul. And Simon calls the song boring. Come on! Now to the song… it’s one of the best Beatles songs of all times. What more can anybody say? Certainly deserving of being one of the rare songs that gets a double feature on your blog! I recall this was the song we collectively crowned their best a few years back, no? However, after a day of Rock Band, I’m reminded that the competetion for such a title is tough indeed. Actually, the winner was ‘In My Life’ but this one made it very far. It was a Song of the Day last December.